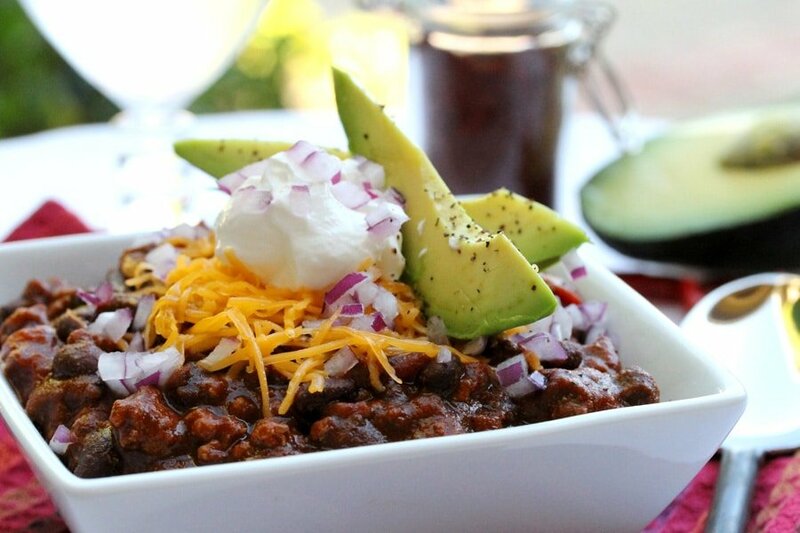 This chili recipe is truly right out of the pantry. And it’s delicious. 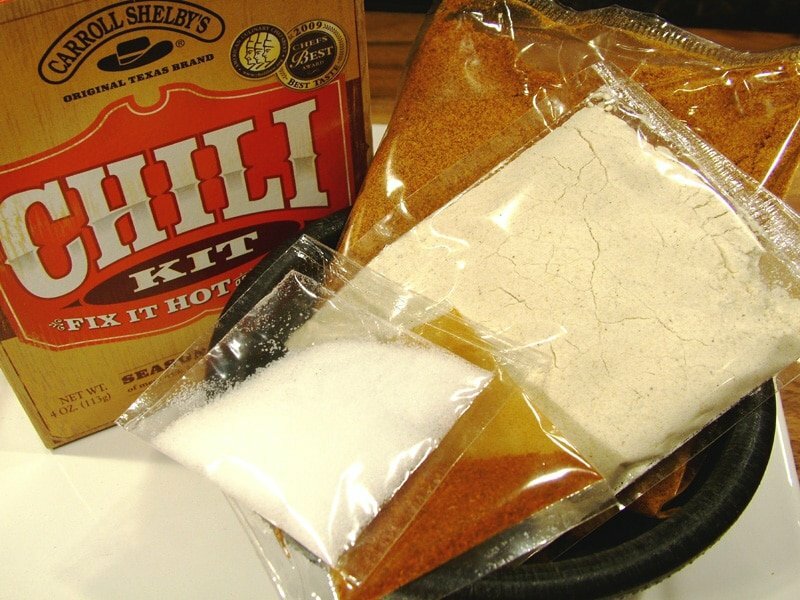 I really like using Carroll Shelby’s Chili Kit because the ingredients inside the box are so simple, just corn masa flour, ground chili peppers, salt, garlic, cumin, oregano, onion, paprika and cayenne pepper. 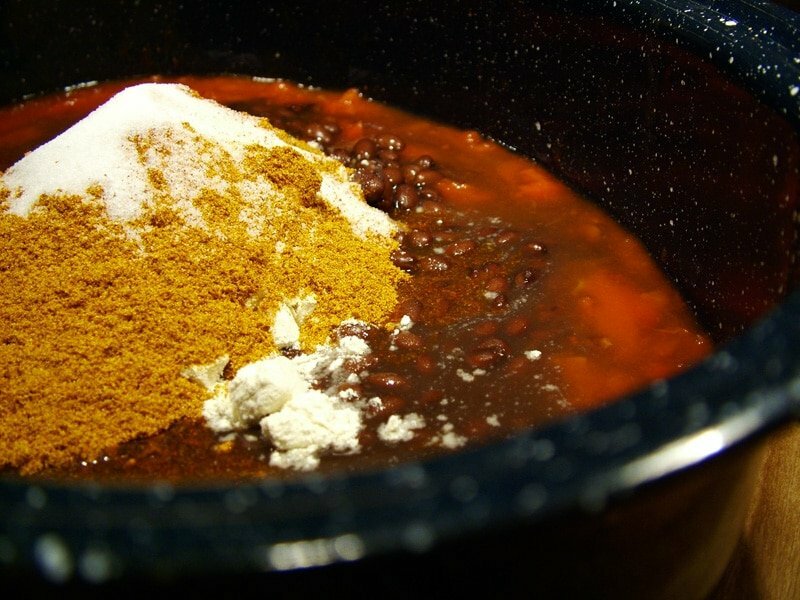 The corn masa flour adds a nice thickness and taste to this chili. And I’m glad that it’s included in this Chili Kit because I wouldn’t want to buy a 5 lb. bag just to put in chili. Although the Chili Kit has cooking instructions on the back of the box, the recipe below is my spin on it. 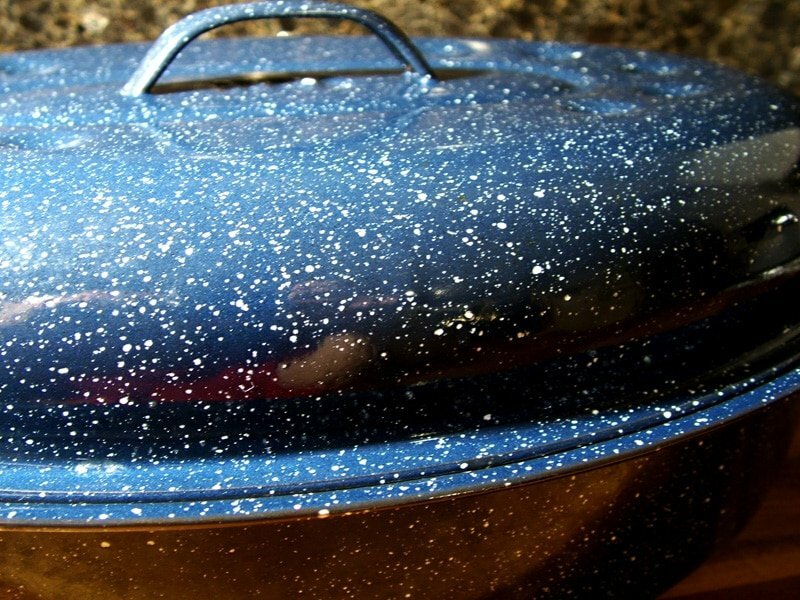 If you have leftovers, try freezing them in plastic food storage containers. I do this all the time and it works great. When I don’t have time to cook, all I have to do is thaw the chili for a super convenient dinner. Leftover chili can also be used to make a chili omelet, or warmed up and put right over scrambled eggs for breakfast. Don’t forget the shredded cheese please. Pour the canned tomatoes into a roaster pan and squeeze them a bit so they’re not in big chunks (I like to use my favorite old fashioned oval roaster for this recipe). 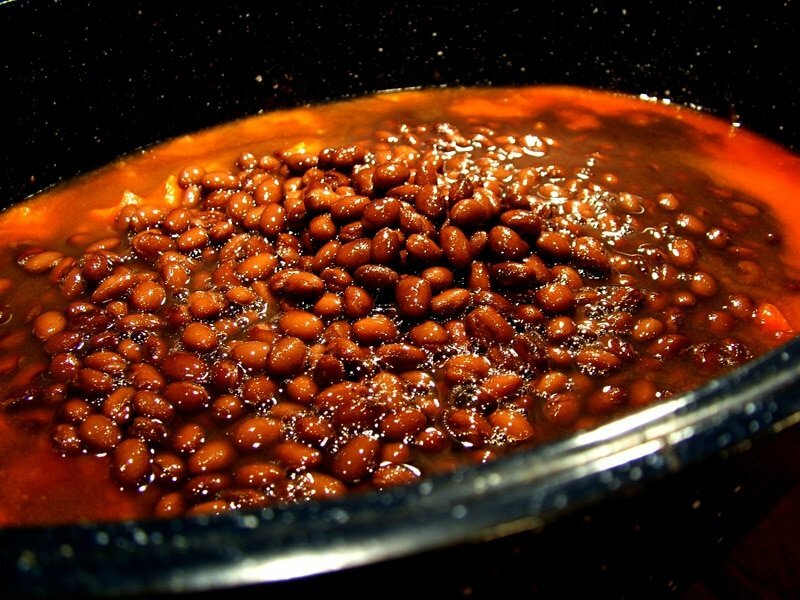 Pour the cans of beans into the roaster pan. Here are the ingredients in the Carroll Shelby package. Add the water and empty all of the Carroll Shelby ingredients into the roaster pan (I just use about ½ of the salt packet). 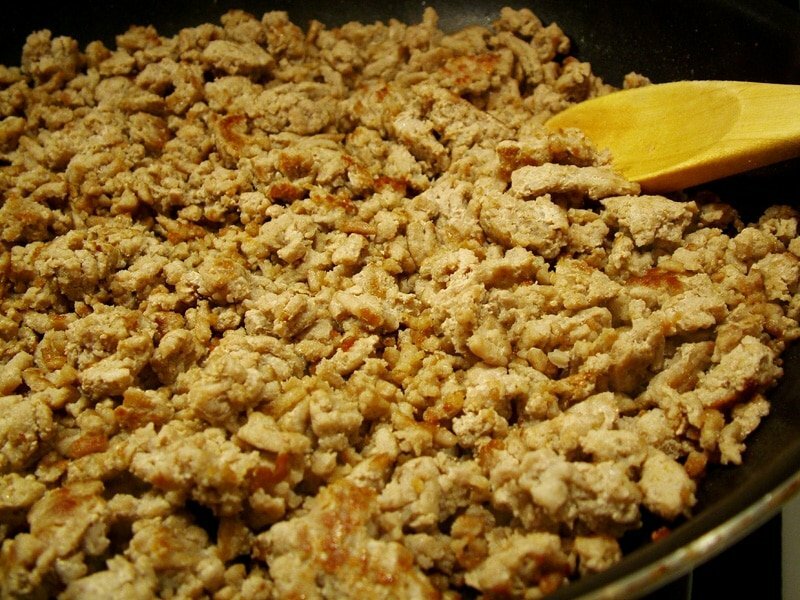 Cook the turkey in a skillet. Add the turkey to the roaster pan. Continue stirring until all of the ingredients are mixed together. With the lid on, cook for about 45 minutes. Then take off the lid and cook for another 20 minutes. 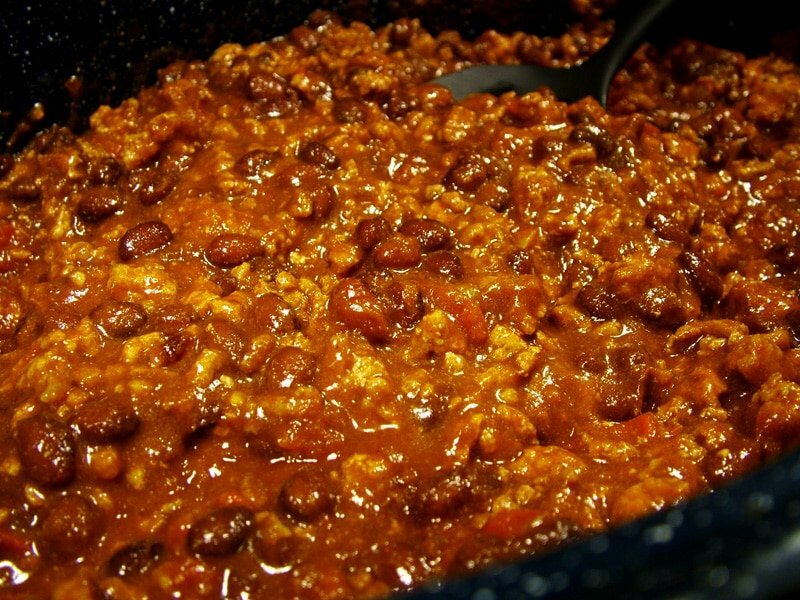 If you like your chili thicker, cook it a bit longer. Or cook it less if you like it thinner. Top with sour cream, shredded cheddar cheese, onions, and avocados. 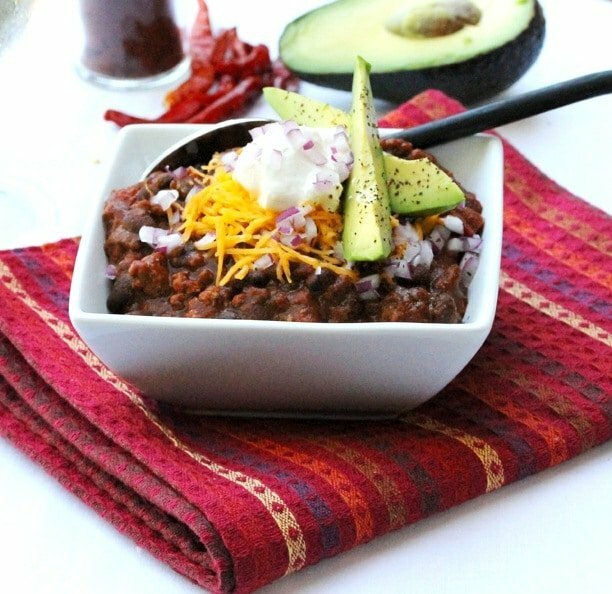 A super easy, robust and delicious semi-homemade chili. 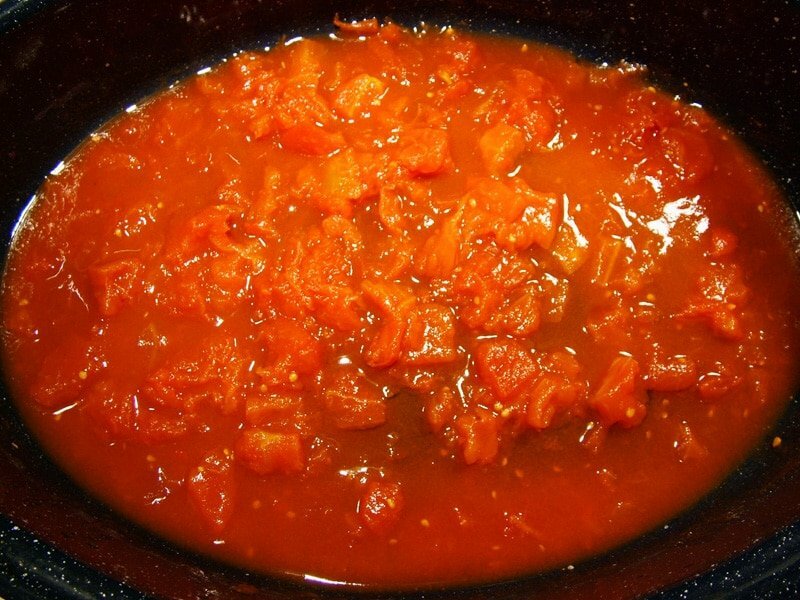 In a small oval roaster, add the canned tomatoes (including the liquid). 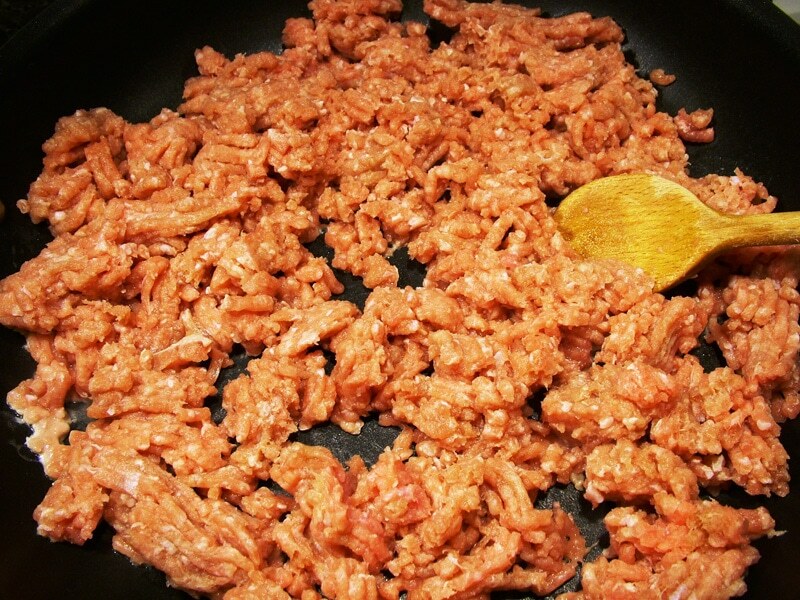 With a clean hand, squeeze the tomatoes a little so they’re not in big chunks. 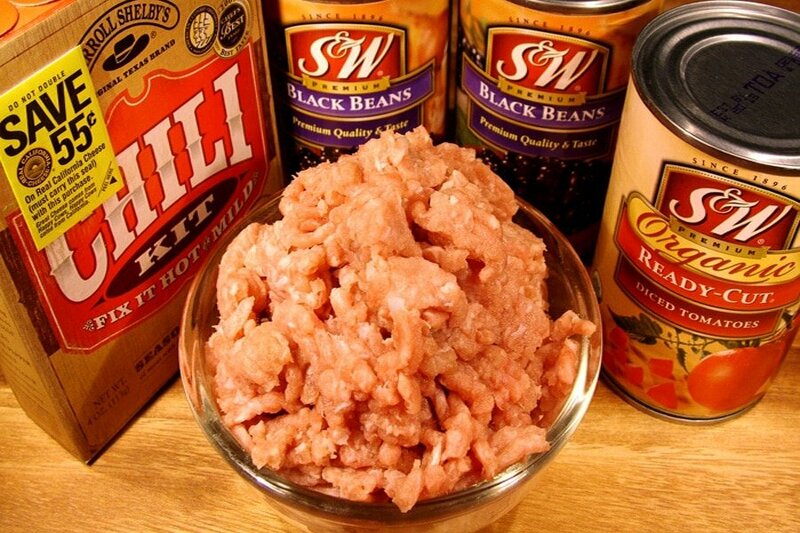 In the roaster pan, add the beans (including the liquid in the cans), water, cooked ground turkey, and all of the ingredients in the Carroll Shelby box. Stir together. Cover with a lid and bake in a preheated oven for 50 minutes. 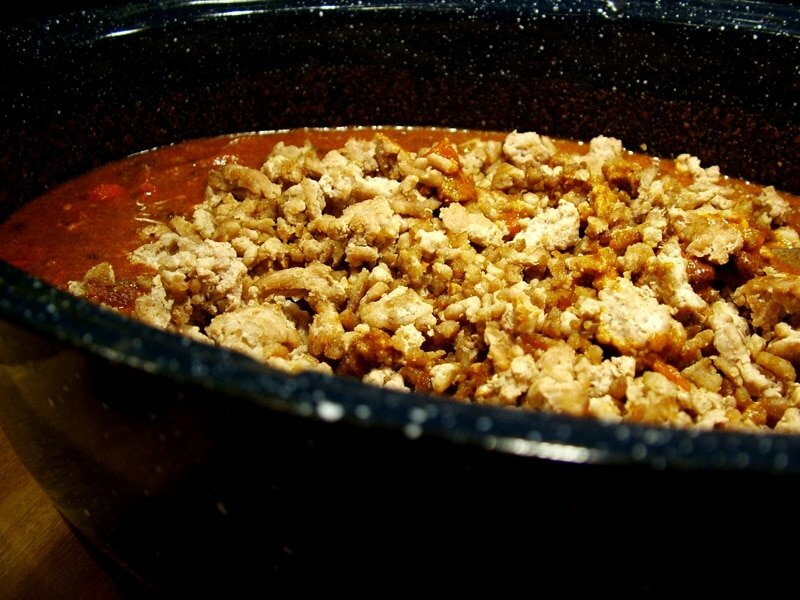 If a thicker chili is preferred, let cook a little bit longer. Serve warm topped with shredded cheddar cheese, chopped onions, sour cream and coarsely chopped avocados.